During recent surveys of citrus orchards in the North of Tunisia sour orange root stocks grafted with clementine cv. Hernandina were observed with trunk cankers, gummy exudation, branch dieback, and brown staining beneath the bark (Fig. 1). 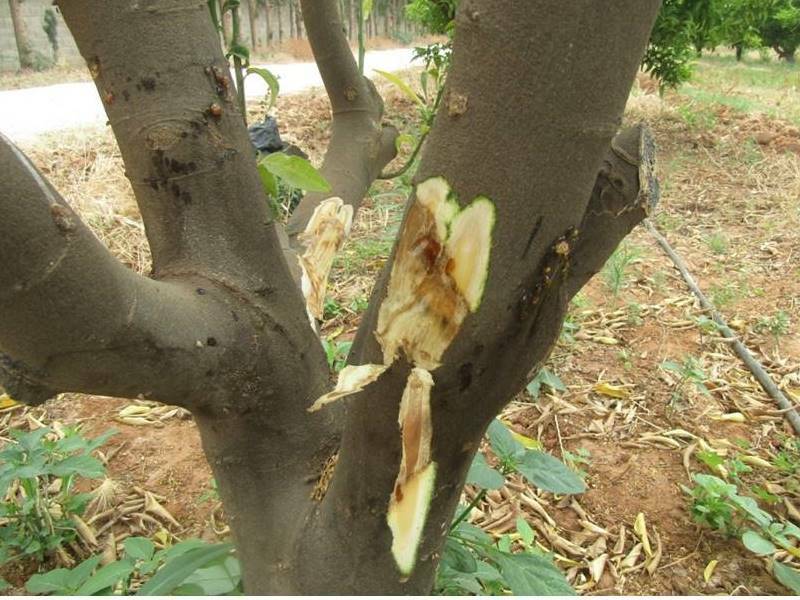 The diseased trees produce poor quality fruit and become dessicated and die after two to three years. 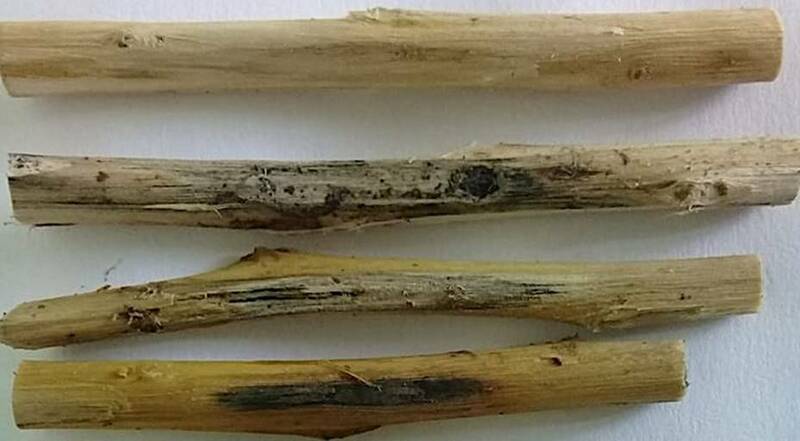 In order to identify the gummosis-causing agent, wood pieces (2 mm × 2 mm × 5 mm) from the distal margin of cankers were surface disinfected (1% NaCl for two minutes, 75% ethanol for 30 seconds, followed by sterile distilled water for 30 seconds), dried, then plated onto potato dextrose agar (PDA) and incubated for ten days at 25°C in the dark. Isolates resembling members of the Botryosphaeriaceae were subsequently subcultured to fresh plates for morphological and molecular studies. Isolates were incubated on oatmeal agar (OMA) at 25°C for ten days with alternating 12 hr near-UV light (320 nm) and 12 hr dark, to induce sporulation. 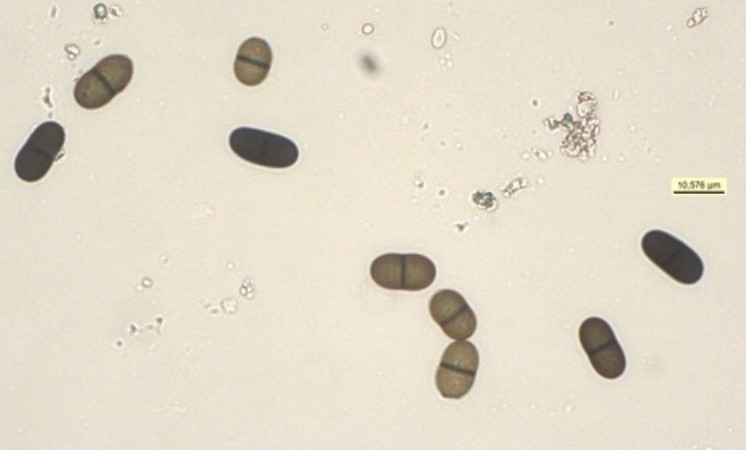 Isolates produced pycnidia within which conidia formed that were 20.2-20.6 × 9.2-9.4 µm, brown, oblong to subcylindrical, one-septate, moderately thick-walled, externally smooth with rounded ends often with a truncate base (Figs. 2-3). 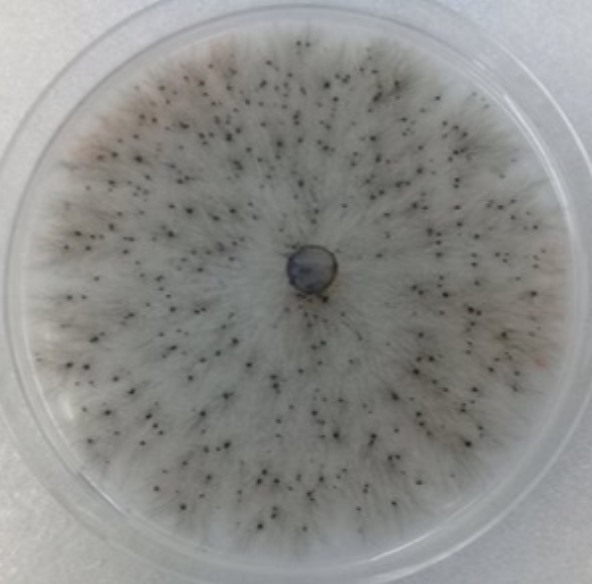 For molecular identification, total DNA from aerial mycelium and pycnidia of monoclonal isolates was extracted. The amplification of the ITS1-5.8S-ITS2 and part of the β-tubulin gene was done using ITS1/ITS4and BT2aF/BT2bR primer sets, respectively (White et al. 1990) and (Glass & Donaldson 1995). The sequences obtained shared 100% and 99% identity with the type sequence of Dothiorella viticola from Spain (GenBank Accession Nos. NR_111186 and EU673103) for the ITS region and β-tubulin, respectively. The sequences were deposited in GenBank (MH236148 and MH249053). An isolate (NH9) was used to inoculate two-year-old twigs (30 cm long) collected from three-year-old clementine plants cv. Hernandina. One wound per twig was made using a sterile blade and 20 μl of a 1 ×10 conidia/ml suspension (produced from a seven-day-old culture of isolate NH9 grown on OMA) was pipetted on the freshly wounded surface of each twig (n = 8). The inoculated twig sections were wrapped in plastic parafin film to retain moisture. All inoculated and control twigs (only sterile water added) were covered with petroleum jelly at their ends to prevent desiccation and incubated at 25°C in a moist chamber. Eighteen days post inoculation, lesion length was recorded for each twig (Fig. 3). Small pieces of necrotic tissue from the edges of each lesion were placed on OMA and incubated at room temperature. The pathogen, D. viticola, was re-isolated from symptomatic tissues of inoculated shoots to confirm pathogenicity. Control twigs showed no symptoms of the disease and no fungus was re-isolated. Botryosphaeriaceae species including Dothiorella viticola have been previously reported causing gummosis in citrus in California (Adesemoye et al., 2014). This report represents the first description of D. viticola as the causal agent of gummosis in citrus in Tunisia. Further research is planned to study the epidemiology of D. viticola since the occurrence of Dothiorella gummosis is increasing in Tunisia. Figure 1: Symptoms of Dothiorella gummosis in clementine cv. Hernandina. Figure 2: Colony of Dothiorella viticola on oatmeal agar. Figure 3: Conidia of Dothiorella viticola on oatmeal agar. Figure 4: Lesions on detached two-year-old twigs of clementine cv. Hernandina following inoculation with Dothiorella viticola (control at top). Glass NL, Donaldson GC. 1995. Development of primer sets designed for use with the PCR to amplify conserved genes from filamentous ascomycetes. Applied and Environmental Microbiology , 1323-1330.